A 90-minute concert feature from southern rockers BLACKBERRY SMOKE is available to watch now online. Check it out below! 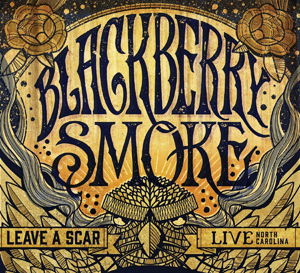 The feature is included on a DVD with the band's upcoming new live album, Leave A Scar: Live In North Carolina, and includes a phenomenal full-length concert along with exclusive behind-the-scenes footage and interviews with the band at home and on the road. The album is also available to pre-order now on iTunes in Europe, including three free-in-advance tracks: "Six Ways To Sunday" (available now), "Shake Your Magnolia" (available now) and "Lesson In A Bottle" (available now).